Did you have a good weekend? I definitely did! Since it was a three-day weekend, on Friday I kept thinking it was Saturday and on Saturday I kept thinking it was Sunday... and each time it was such a pleasant surprise to know I had an extra day! Today we're starting the last unit of the first year of med school - Musculoskeletal. I can't believe I'm almost going to be a second year med student. Time is just flying by! 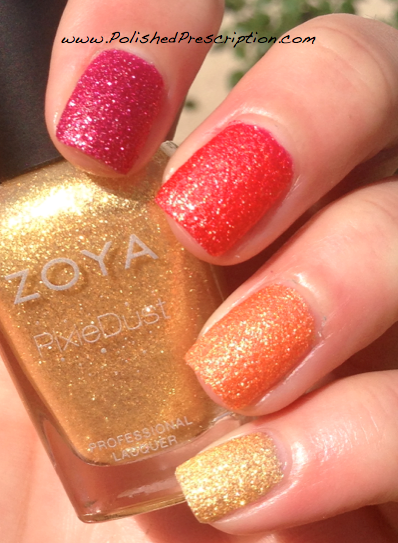 Today I want to show you 4 of the 6 polishes from Zoya's Summer PixieDust collection. I'm sure most if not all of you have seen so many pictures from this collection, but if you haven't, this post will be even more exciting! I used four of the shades (Miranda, Solange, Beatrix, Destiny) to create an ombre manicure.. and I LOVE how they all look together! 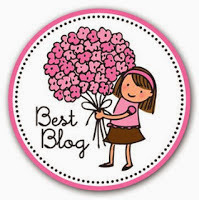 Click on the link below to read a review of the PixieDust and to see (many many) pictures! Just for the sake of being thorough, here's a quick description of the Summer PixieDusts: this collection was released for Summer 2013 and consists of 6 matte, textured, sparkling shades. 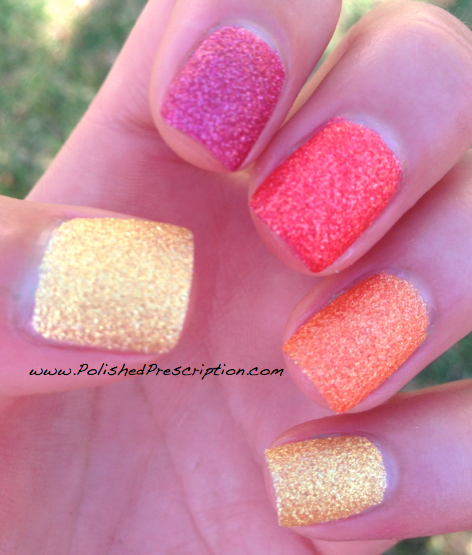 Three of them (Liberty, Stevie, Miranda) have the original formula with silver glitter. 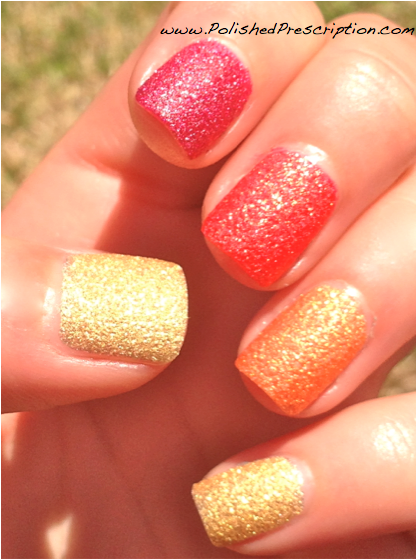 The other three (Beatrix, Solange, Destiny) have the new "Foil Twinkle" formula. And WOW do these babies sparkle! All of these polishes apply great and are so easy to get on the nail. They all take about 10 minutes to completely mattify and get dry to the touch, but they take at least 45-60 minutes to be fully dry to the point that you can bang them on something (not that I ever do that or anything) and nothing happens. I only needed 2 coats of Solange - the formula was AWESOME and it was so packed with the gold pigment and glitter that one coat almost seemed like enough. I needed 3 coats of the other 3 polishes to get them completely opaque. Here are the 4 polishes I used. From left to right: Miranda, Destiny, Beatrix, Solange. When I first saw promo pics for this collection, I only wanted Miranda and Liberty. However, I'm so glad I got all the rest (minus Stevie) because I love all of these polishes! Destiny and Solange surprised me the most and ended up being my two favorites, although it was hard to choose. Even though Solange is a very yellow-based gold, it still worked with my skin tone and it looked stunning in the sun. I also love Destiny because it's not a straight up red shade like a lot of swatches make it seem (and like it may seem in my photos too haha) - it's a true coral that has strong pink and orange undertones in a red-orange base. Also, I love all of these polishes together! 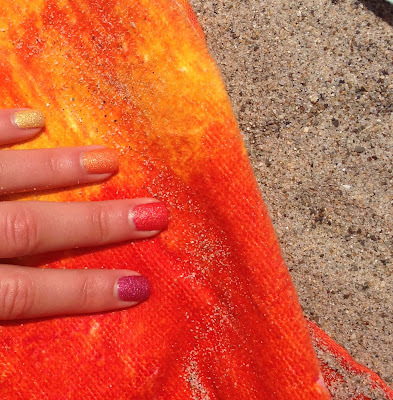 Such a fun ombre effect and perfect for summer! So now on to the photos! All polishes are three coats, except for Solange, which only needed two. And unless otherwise noted, the pictures were taken in the sun. I took A LOT of pictures, so brace yourself! Lastly, here's my attempt at capturing the incredible blingy-ness of the gorgeous Solange. AHH! SO GOLD AND SPARKLY! I absolutely love how these all look together, and I love how perfect they are for summer! I got a new beach towel on Saturday and noticed it matched perfectly with my mani... so of course I had to take a pic. Clearly I like this color scheme haha. Phew! So many pictures! Sorry about that... I have such a hard time trying to narrow them down. So are you guys loving the bright-colored textured trend as much as I am?? 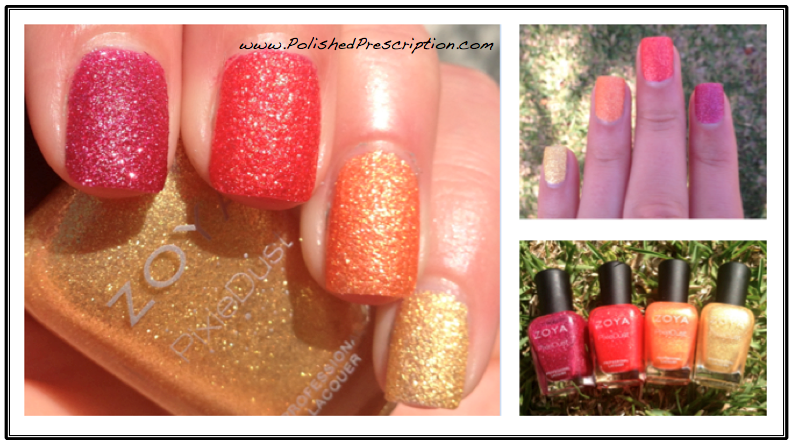 This collection is perfect and I give props to Zoya for making a collection that makes such a statement and stands out among all the other textured polishes we're seeing. I know aren't they?? I love all of them and they look even better and more dynamic in person! Solange in the sun is to die for. I love how the glitters "dance" in the sunlight! 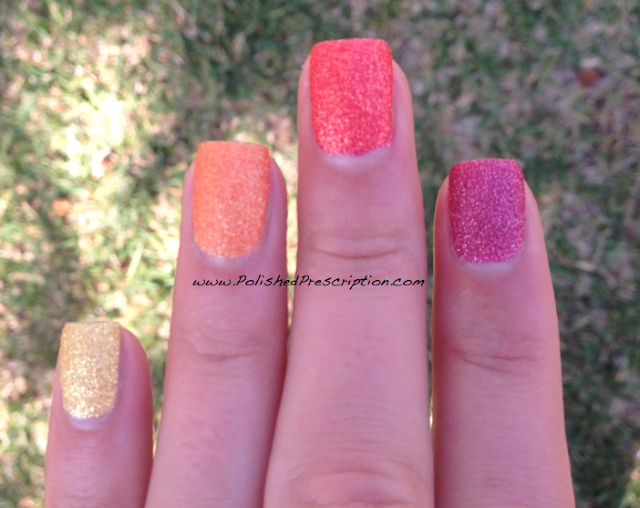 I don't own any of the Pixie Dusts but I will pick them up eventually ;-) Beautiful skittles mani!! That's the perfect way to describe them - dancing! These are so sparkly in person, you'll love them if you end up getting them!